Heat oven to 350°F (325°F for dark or nonstick pans). Spray bottoms and sides of four 8-inch square pans with baking spray with flour. In large bowl, beat 1 cake mix, 1 cup of the water, 1/2 cup of the oil and 3 eggs with electric mixer on low speed 30 seconds, then on medium speed 2 minutes, scraping bowl occasionally. Divide batter between 2 of the pans. Bake 27 to 34 minutes or until toothpick inserted in centre comes out clean. Cool 10 minutes; remove from pans to cooling racks. Cool completely, about 30 minutes. Repeat with remaining cake mix, water, oil and eggs. Chill cakes in freezer 45 minutes before cutting to reduce crumbs. Cut off domed top from each cake so they will be flat when stacked. On tray, place cake A (see diagram); spread with 1/3 cup frosting. Top with cake B; spread with 1/3 cup frosting. Top with cake C; spread with 1/3 cup chocolate frosting. Reserve 2 tablespoons frosting in resealable food-storage plastic bag. To seal crumbs, spread thin layer of frosting over layered cake, and refrigerate or freeze cake 30 to 60 minutes to set frosting. Spread remaining frosting over entire cake. Place fudge-dipped cone upside down on centre of cake. Place 4 regular ice cream cones upside down on corners of cake. Dip edges of miniature cones into white decorating icing; sprinkle with blue sugar. Place upside down on top of larger cones. Top each cone with candy star, attaching with small amount of white icing. Cut 1 wafer cookie in half crosswise. Cut tiny corner from bag of frosting; pipe frosting on 2 whole and 1 half cookies for window panes. Place windows on castle. Insert ends of pretzels slightly into cake for drawbridge. Place 2 cookies on drawbridge for door; press tops slightly against cake. Add cinnamon candies to doors and front of cake. Add licorice for bridge wire. Place peanut butter cup candies upside down on 4 corners near top of castle. To make turrets, add red jujube candies and gum balls to peanut butter candies with small amount of white icing. Add caramels to front of cake for parapets. Store loosely covered. 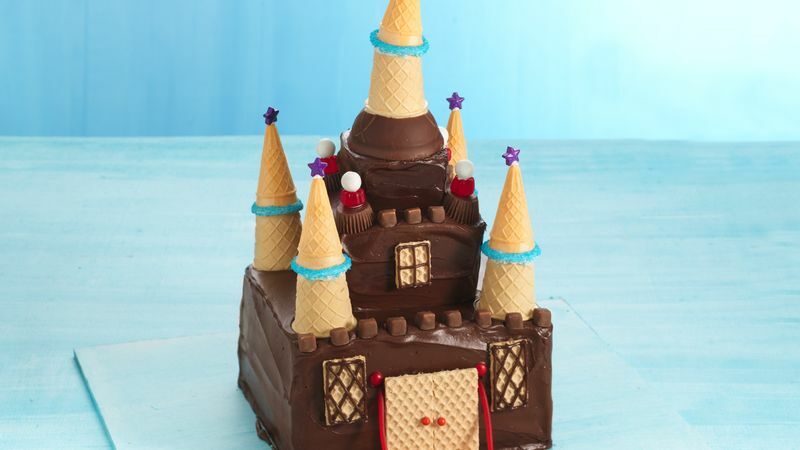 This cake is perfect for a princess-themed party. Look for inexpensive tiaras and wands at your local party-supply store.